Kalives is a busy working village. 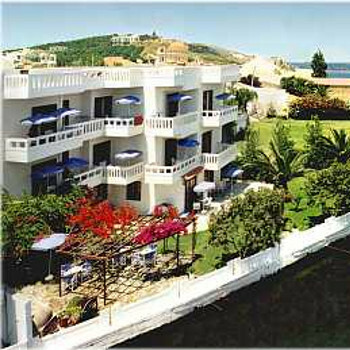 It has some facilities for tourists but is very Greek. There is a lovely beach to the east with plenty of sunbeds. The ones outside the beach tavernas are free to their customers. A small beach is next to the river then there is an expanse of rocks before the west beach which is again quite extensive and sandy with sunbeds and kantinas/tavernas. There are about 10 tavernas in the village. We never had a bad meal. Some of the tavernas are quite touristy and others more traditional. We expect to be brought and charged for bread but a couple of them now bring you a bottle of water without being asked which you presume is free until you get the bill. We realised these bottles are the sealed ones. Other places gave you complimentary water and some waited until asked. Most places gave free cake and several shots of raki. We ate at Provlita, Akrogiali, Medusa (twice) and Zorba's in the village square (twice). This is a great little family run place. Try the chicken pie! It covers the plate, the pastry is so light. One lunch time we ate at Kritico. It was excellent with a lot of free stuff - water, dip, lovely warm bread, cake, wine for me and brandy for hubby at the end. These freebies were however reflected in the price - the cover charge being €1.20 each. I think there was a €1 service sharge as well. There are a couple of bars in the square and also a few on the beach. Bottles of Amstel/Mythos €2-2.50, spirits €4, they always serve free nibbles with the drinks. There are a few tourist shops, some jewellers, car hire, gyros shops and local shops such as butcher's baker's, fruit etc. The most noticeable thing is the large amount of property shops - at least 6 or 8. There doesn't seem to be a lot of development in the village but there is in the surrounding villages and hillsides. I hope the area isn't spoiled. Kalives is a good base for touring the local area. It's close to the coastal highway. Almyrida is about 3 kms away and is an ex-pat enclave. It does have lovely beaches and water sports. The first beach is very stony and great for snorkelling. Sunbeds are €6. We had lunch at The Beach Hut twice. It is run by the 2 chaps who were on the TV prog 'A Place in Greece'. Their fresh sandwiches were really delicious and served with crisps. Georgoupolis is about 30 mins away and is a much larger, more commercialised resort. It has a big village square and lovely long beach. There is a river where you can get a pleasure boat and paddle upstream. Lake Kournas is about 4 km away from here. It is a freshwater lake and is quite beautiful. There is a beach and sunbeds and pedaloes etc. It is quite commercialised but well worth a visit for the scenery. We went to Chania from Kalives on the local bus which runs several times a day. You can get tickets from the supermarket or pay on the bus €2.20 each way. Hania is well worth a visit. The venetian harbour is great and the Old Town. We wanted to go see the local indoor market which we did. Unfortunately at least half the shops were selling almost identical tourist goods and it was disappointing. The actual shops are great. There is a street full of leather shops in the old town. I would not attempt to take a hire car in to the city - too much stress. There is a nautical museum. Kalyves is a friendly, busy, working village. The locals are very helpful and prices are not as high as I imagined. Tavernas along the beach tend to be a bit more expensive, but only by a few euros. Generally the food is good and plenty of it. No entertainment to speak of in the evening but great if you like taking it easy after dinner with a few cocktails. The beach outside the studios is very quiet and the other side of the jetty is more lively. A couple of days the sea was rough and the life-guards were doing a great job keeping the kids out of the sea. Quite, unless in village centre and wanting to sleep at night. Not music, its traffic that will keep you awake. Nice people, nice little town, good beach, lovely scenery around. Plenty of basic tavernas, a couple of bars, enough shops for basic, and some luxury, needs. Need a car as the bus service is very poor and all ways out of the village seem to lead up very steep hills. Would recommend for a peaceful week or two but little point in going more than once.